Help me pick a business card design! I am a very indecisive person. Also graphic design is definitely not one of my strengths. So based on some suggestions that my boyfriend's dad (who's a professional) made, I've ended up with these. There's actually only 3 designs, and then the variations thereof. I'm gathering other people's opinions before making my final decision. I really like the square design but it's less practical for several reasons (would have to be folded into a triangle to fit in wallet, which would crease the text, and make it more prone to tearing). But it may be worth it since it would stand out more. So the variations are what information goes on front: logo+website or logo+name. (If I went with the latter, I would probably switch the logo to be the one with ".com" in it). Main difference on the backs is the font my name is in. Then there are the first two rectangular designs. Both of these are designed to have all the information on one side. The one on the left spawned from the one in the middle. Third rectangle design is the plainest but I think it conveys the information in a very easy to read way. This one is two-sided with the gigantic logo(.com) on the flipside. So, any suggestions? Which one do you like? Any layout suggestions? How do you feel about the fonts? Content? Phrasing thereof? Regular logo versus the .com version of it? • As a designer, your boyfriend's Dad should know that using diagonal text on a business card is iffy at best. It makes reading them at a glance more difficult. Especially with those colors (see below). • Black text on red is very hard to read and just a bad design choice no matter what you're doing IMO. In general bright red is a lousy background color for small text. It's very jarring to the eye unless you have bold black lettering on a large poster or something like that. This is design 101. • Stark red and white as a theme, don't communicate very well who you are / what your profession is about IMO. Red is too strong a color. It should be an accent not the major thematic color. The little x's inside the letters or the o in "dot" could be this color red, but not half the card. • Anything not a rectangle is a BAD idea for a business card unless you make origami for a living. I know it's clever and stands out. But, by asking the person you're giving it to, to take extra time to read it or figure it out, and then find a way to fit it into their standard card size slots, is a mistake. All great business card designs are simple, and fit within everyone's standard rollodex, dayplanners, etc. A diamond shaped card (though technically a square rectangle if set on edge) is not going to make someone go "wow, very clever". Instead it will probably just get shuffled under some other debris on their desk or wind up in the trash because they couldn't immediately just slide it into their card holding system. Personally, among these, I would choose the one at top right (assuming the horizontal variant below is the opposite side of said card). It is the easiest among all of them to read and stuff in your wallet or day planner. Not a big fan of the font used for your name on this card, however. Also, IF you really like these designs, I would experiment with different spot colors beyond fire engine red. Try flavors of green (darker shades), blue (blue-greens or blue-grays maybe) or brown (bronze or rusty variants for example) as your counterpart to white. If you want to go red, go towards maroon IMO. Same design, just swap in some of these other colors for the red and see which ones you like. Then use a brighter color with more pop for the accent on the letters or whatever design elements are ultimately used. No offense to you or your boyfriend but I kind of question whether you should go with his Dad as the designer, unless he has tons of other cards in his portfolio to show. There are many biz card designers online that will do a great job for you and have really nice portfolios, and probably aren't too expensive. Last edited by Moogs : 2008-07-08 at 09:08. Nonstandard shapes aren't "cool" or "distinctive". They don't fit in my business card storage and are irritating. That's my main gripe. That's a necessary annoyance online, but in print it's just needlessly frustrating. In fact, if I saw that on a business card, I'd probably throw it away. 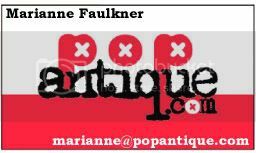 Personally, I would get rid of the stylised Marianne Faulkner logo - there's already a nice popantique.com logo on there and I wouldn't want another logo to clash with that. As already stated, all but one of them do not have the standard aspect ratio for a business card. The logo font is ok - as it's somewhat distinctive, yet still readable. But the typeface for the rest of the text is too hard to read. Overall, the cards look too busy. That said, your website is very nicely designed, indeed. I wouldn't change a thing there. The cards are based mostly on rough sketches he made in my sketchbook after having seen my old, hideous business cards, which otherwise don't even bare mention here. I'll scan the page if I can dig up the sketchbook in question (it's not on the shelf where it belongs). Oh, ye gods. I really, really like the pink. (It's supposed to be that strawberry-imac-is-it-pink-or-red-shade.) I'm not blowing off the idea of other colors out of hand, I will definitely mess around with them, but there are just no others that I really like enough to want them to represent me. To me, the pink says "bright, energetic, youthful." Even though I know it's cliche, black/white/red or black/white/charcoal are my favourite color sets to use. When I was doing my website, I tried using purple and teal, but it's hard to find a shade the conveys the same vibrancy that I would expect out of a similar shade if it was a tangible object (such as a yard of silk). I think by mutual opinion of pretty much everyone I've asked plus my own logical evaluation, the square cards are out. But for the record, I don't plan to hand these out like after-dinner mints. There were times when I lived in LA where people saw me with my sketchbook or my pattern set and they would stop and ask me if I did design/pattern drafting and then they would ask for my contact information. Obviously no one ever calls if you just write your phone number on a scrap of notebook paper. I intend more to use the business cards as a means of contact with people who are already interested. It has to do with the font I used, which doesn't have an @ sign for some reason. I am not sure why I didn't just use courier for that one character as I did on all the other variations. Originally Posted by Is it 1981? I think I was just looking for an excuse to use that font. I should've used my instincts (which were telling me "That's too many fonts!") and left well enough alone, though. But the typeface for the rest of the text is too hard to read. I admit that the font is easier to read in larger sizes. The reason I used it is because it is the font in the logo: I came up with the idea for the logo, and was trying to figure out what fonts to use to create it. 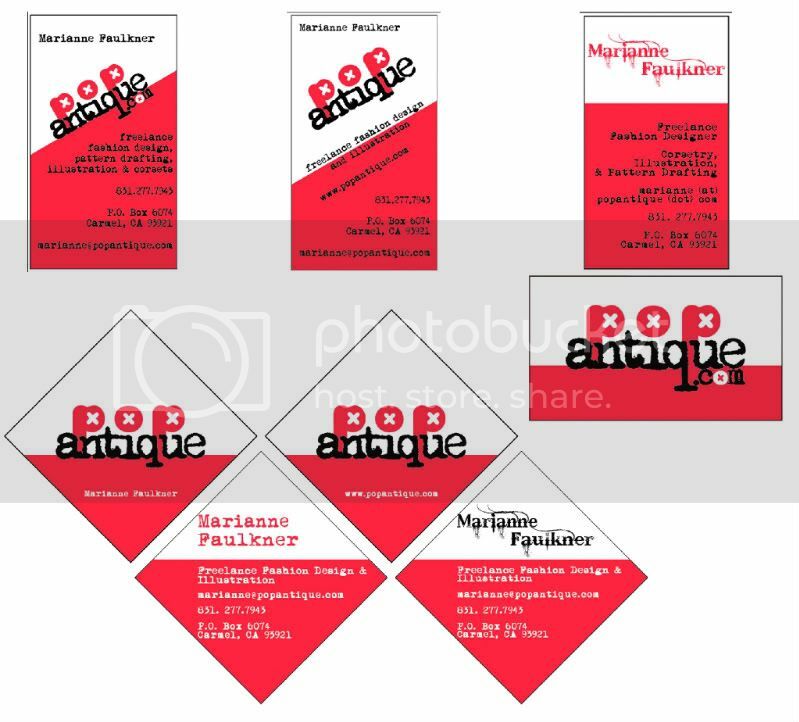 I knew "pop" should be some bubbly looking font, but I wasn't sure about "antique." My friend Alex said something along the lines of, "What about a typewriter font? But not a normal one; one that's kind of gritty and old looking." And I thought it was perfect: I like monospace fonts because I'm slightly Monk-ish with balance/symmetry, and using something that actually looks like it came from a typewriter gives it a little bit of quirk and a vintage feeling. Thank you! I'm kind of surprised that I keep getting compliments on it, as my knowledge of HTML and website building is approximately equivalent to half a semester of a basic web design course at a JC. Anyway, I'll go poke around in AI some more and try to refine a bit based on all your suggestions. Thank you, everyone for your input. I can respect that... was just saying to keep your options open. Biz cards can be a first impression a lot of times; they're important. Oh, ye gods. I really, really like the pink. (It's supposed to be that strawberry-imac-is-it-pink-or-red-shade.) I'm not blowing off the idea of other colors out of hand, I will definitely mess around with them, but there are just no others that I really like enough to want them to represent me. To me, the pink says "bright, energetic, youthful." OK, except that the colors I'm seeing in your OP are nowhere near pink. I don't think my laptop monitor is that badly calibrated but then again maybe it is. First, I'd stay away from the square. Lots of people (especially in the design/fashion profession) try to do non-standard business cards, to show how creative and "outside the box" they are. It's become a cliche. There are Flickr pools and online galleries devoted to unusual business cards, and some of them are admittedly clever. But many of them are just "different to be different" and annoying to those who receive them. I think that's where you're square falls, to be honest. Basically, if you're going to go with a nonstandard business card, you had better have a damn good reason - and just wanting a unique shape isn't. You say you might keep the square design for your tags. I would consider going the other way - maybe making your business cards look like your tags? They both contain the same information, to a point, and that would allow you to give your business card some visual interest and uniqueness (a punched hole, trimmed corners) while still fitting inside a standard business card holder. Second, your color palette. You say you love pink - and I do too - but it really registers as red on a computer monitor, and red, black, and white is pretty much the harshest color combination I can think of. Unless you're Target, an ambulance, or the White Stripes, it should usually be avoided at all costs. I haven't seen your fashions - I don't know if they're similarly bold, and that's what you're going for - but I do know an age-old adage for design that still holds true today: If you want to make something look more expensive, soften the palette. When you think of your archetypical perfume box from a high-end brand, it's probably not red, white, and black. Again, I don't know if expensive is what you're going for, or not. These are just my thoughts - take them or leave them. But I would at least try using a lighter pink, and see where it takes you. If you decide you hate it, it's okay. A final word: Take the compliments to your website to heart, and then look at your business card. The reason everyone loves your website (or the reason I do, at least) is because it's so simple. It's understated. It doesn't have competing fonts or diagonal text - and that's why it works. Keep that in mind while you finalize your business cards, and good luck! While you're at it, I highly recommend renting the documentary Helvetica. It may be a source of inspiration. I prefer the card design in the upper right also, but without the swirls through the lettering of your name. The color looks bright red-orange on my screen, with not the least hint of pink. Also, of the colors you mentioned liking, I think charcoal, red and white would be nice; or, even better, maybe charcoal, medium-light grey and red. Maybe a card that's 1/3 medium-charcoal, 2/3 medium light grey, with red lettering. But, really, the design of your card is *extremely* important, and it should speak for you 100%, since you are in the very business of design. The card will be like a small resume for everyone who sees it. I would just advise that you try a few more subdued color combinations than simply so much red (or whatever color of pink it's supposed to be). But, in the end, if you love the red/pink, then that's what you should go with, because it will represent your taste most accurately. You mentioned teal. I love teal. Teal and purple on light grey card stock would be nice. Maybe 1/3 teal, with a purple band, light grey for the rest of the card and maybe charcoal lettering. Your designs are fun and it sounds like you have a great career in your future. Good luck with your decision. Alright, I'm working on it now. Despite everyone liking the top right one, I just get a bad feeling from it: It feels really template-y. So I'm streamlining the top left one, and the flipside will be the simple "popantique.com" logo with the colored bottom bit. If I had to pick one of those words to best express it, it would be whimsical. If I had to pick a designer with a similar style it would be Betsey Johnson (whom I adore). Last edited by popantique : 2008-07-09 at 04:32. I actually like the card with the very simple logo in the middle. I would just add your name and e-mail. All that descriptive stuff and your snail mail is not that important these days. If people want to get in touch, they'll e-mail you or go to your website first. I have no explanation for this. I used an HTML color for the pink, #FF0033, and it has always been approximately that shade on at least the three last computers I've owned. I will admit that it's a very red pink. On the do-overs below, I substituted it with a very similar shade from the pantone palate in AI, as well as doing one in a pinker pink and a darker pink. Pinks are a tricky thing. I don't want it to look too pepto bismal, too its-a-girl, or too barbie. But I would at least try using a lighter pink, and see where it takes you. If you decide you hate it, it's okay. I like bold. If I'm doing something for a client or to build my portfolio, I'll probably try to mix it up a bit, but left to my own devices I would probably make 75% of my garments in some combination of red, black, and white. I did mess around with richer and dustier pink and purple tones. I don't hate them (anything I hated, I changed before it got very far), but lord knows how long it will take me to go through these cards and what my second-favourite colour palate will be by then. Right now I'm at the end of a jewel-tone kick (purples and teals especially). I do know an age-old adage for design that still holds true today: If you want to make something look more expensive, soften the palette. When you think of your archetypical perfume box from a high-end brand, it's probably not red, white, and black. Again, I don't know if expensive is what you're going for, or not. It seems to me that the cause and effect would be a little different (though I admit you would know better than I): few people are going to pay an expensive price for an unknown product or brand, so logically if expensive then it's already known. If it's already known, then it doesn't have to try very hard to attract your attention. Since I'm not already known, I want to be a bit of a peacock and get noticed. I don't want my card to blend in with the generic mass of cream-with-black-text cards. Obviously I don't want it to stand out because it's ugly, though! I am trying to find the middle ground here. Expensive isn't really my market. Quirky is my market. (Less Chanel, more Betsey Johnson.) Since I just graduated and started freelancing recently I don't feel justified charging a lot of money, and it would be hypocritical to expect people to pay a lot of money where I wouldn't (being a cheapskate and all). Ahaha. So, I tried this, and it came out as an exemplary case of ur doing it rong. (see bottom right, below). Thanks again to everyone who pitched in their two cents. Here's what I came up with after reading all your comments and factoring my own bias. Okay. There's a million (well, 14) variations on the style that was in the top-left of the first picture I posted. Flipside would be color-coordinated version of the horizontal design at the right of the same. I took out the word "freelance" and the mailing address to free up some room so that the text could be easier and bigger to read. I also changed the word order around for purely aesthetic purposes (so that it'd be angled like the color block). There's no diagonal text to be found here, unless you count the logo (and I don't know if you did). -Name on two lines. I usually did this when having it on one line took up too much space (I wanted to keep the name more on the left for balance). -use of normal logo versus the one with the ".com"; there are also some where I just deleted the ".com" text (difference is the stem of the q. If I don't use the .com then I'll probably change said stem to be in between the two lengths). -on the dusty purple one, I omitted the logo entirely and raised the color block accordingly. I actually think this looks pretty good. -on the one at the bottom right, I moved the logo/color block up and to the left a bit, to eat up a bit of the dead space that was left after I erased ".com" I don't think I like this. In terms of the colors, I think the pink (middle, top row) is still my favourite, though I also like the grey with swirls (middle, bottom row). There are a couple others I like (such as the two-tone pinks on the right in the third row) but I think I'm less likely to get sick of the pink or the charcoal for however long it takes me to use up my cards. The phone number especially is barely readable in most of those examples. Aside from logos, informational text should be an easy to read, serif font. I'm rather fond of that one as well. At this point I'm planning on using that (but just the logo) as the flipside. Really clean and uncluttered, with all the other info on the back. Yeah, my quality control isn't too great at 4 AM. Sorry 'bout that. Any in particular you love/hate? I'm trying to create a little bit of a mood with the font, so if I didn't use it in one of the above cards chances are I thought it was too dull. By the same token, I don't want to cross the line from funky to illegible. Good: top row, middle; second row, third; both fonts used in the last row. Bad: really mostly the two on the right in the third row. But it wouldn't be very difficult to change the font (to something that blends in, not a completely different one!) for just the numbers. Of the new ones I would either go with the blue-green variant (it is artful, classy and very easy to read compared to most of the other ones). Second choice, I'd with the variant immediately below blue-green, only changing the swirly color from light peach to something slightly more saturated buta similar hue. All of these diagonal designs are better than the last one. Remember you're trying to avoid small diagonal text (especially if overlaid on a strong color), not necessarily diagonal design elements by themselves. The first one on the second row, for sure. Or, if you really love the pink, the colours of the first one with the font choices of the the first on the second row. changing the swirly color from light peach to something slightly more saturated buta similar hue. The peach as you see it now is one of the default swatch options on which I simply lowered the opacity to 50% - anything much higher than that makes my name a bit hard to read. And I have to confess that other than layering that pattern and changing the opacity, I have no idea how to mess with it (i.e. to try it with other colors... 'cause you know I would've tried that damn pink if I could). A color-coordinated version of the horizontal design from the OP. I like the blue-green new one the best. Easy to read text, nice color, says what you need it to stay and still sticks out from a plain white card with black text.